By Daniel Horowitz--When he launched the $100 million Schulich Leaders Scholarship in October, 2011, aimed at encouraging Canadian and Israeli students to enroll in STEM subjects, Canadian business leader - and one of the world’s most visionary philanthropists - Seymour Schulich, made his motives clear. Mr. Schulich personally selected UJA Federation of Greater Toronto to be the administrator of the scholarship program. And, true to his words, after 40 Canadian Secondary School graduates were selected out of a pool of 977 high schools, Mr. Schulich launched the search for 20 Israeli recipients in January 2012. And, earlier this month, along with Ted Sokolsky, President & CEO, UJA Federation of Greater Toronto, and David Goodman, UJA Federation’s Director, Schulich Leader Scholarships, Mr. Schulich traveled to Israel to personally recognize the Israeli students – selected in August - who will benefit from his generosity. Those selected represent five Israeli universities: Bar-Ilan University, Tel Aviv University, The Hebrew University of Jerusalem, Ben Gurion University of the Negev, and Technion – Israel Institute of Technology. 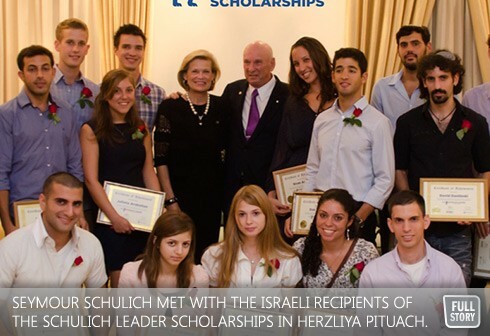 “You are the inaugural recipients of The Schulich Leader Awards in Israel,” Mr. Schulich told the crowd. “You are unique as you were selected from close to 600 nominees. You join a group of 40 winners from Canada, who were selected from approximately 1,000 nominees. This award should carry you through your undergraduate years in one of the top 5 Israeli universities. You folks are very young and therefore rich in energy and time to expend on your passions in life. We are highly confident that many of you will make huge contributions to Israel and mankind. At the ceremony, which took place in Herzliya Pituach, Mr. Schulich was joined by Israeli’s minister of science and technology, Professor Daniel Hershkowitz and Dr. Uzi Landau, the country’s minister of energy and water resources as well as other dignitaries including Tel Aviv mayor Ron Huldai, former IDF Chief of Staff, Gabi Ashkenazi, and prominent businessmen Michael Strauss and Michael Federman. "The launch of Schulich Leaders in Israel signifies the beginning of a tremendous support system, cultivating a powerful network of leaders pursuing STEM as a primary educational stream” said Goodman.